Today Is my day 1 of a 15 day juice only reboot. I did the 15 day program and took 2 days off. I lost 17 lbs in the 15 days my original goal is 30 lbs then reassess. I wanted to start with 30 so I wouldn't be overwhelmed at the thought of making a 50lb goal and not seeing weight loss. I have a pituitary tumor that slows my metabolism, so in the past it has taken me months to lose weight then it slowly creeps back on. I can see making this a regular part of my life and converting to a whole food vegan way of eating. Today I made UnBeetAble for breakfast, Aussie Green for lunch and dinner, and Australian Gold for an afternoon snack, and purple passion for Dessert. I have my own Kale growing, it grows over a 2 year period so I just cut the leaves off and place them in a water glass. I also have beets, and substitute the beet tops for chard in some recipes. I also like them cooked or in salads. Right now we are juicing! My husband has been a great support, and today he left on a 4 day golf outing with some friends to benefit breast cancer. So I am inspired to lose a few pounds before he returns! Juice on my friends! This topic contains 365 replies, has 1 voices, and was last updated by Soose 4 weeks ago. Hello all I have not posted here in some time, I should check in more often. I lost 40lbs on my original journey and then regained 20 over the next couple of years. I went back to juicing, however it was harder to start the second time around, and I did lose weight doing the juice fast, however it seemed harder to keep off. This time around I saw a free diabetes summit online with many of the great diet lifestyle doctors. Dr Michael Greger, Ocean and Dr. John Robbins, Dr. Joel Fuhrman, Dr Dean Ornish, Dr Neal Barnard, Dr Walter Longo, Dr Alan Goldhamer, Rip Esselstyn, Chef AJ, several dietitians, nurses, more doctors whose names I can not recall right now. So I signed up and listened to all of them speak twice. I carried my phone while I was walking, working in the garden, doing household chores, or in the car and listened to each person over the course of the week, and repeated all of them as well. Once it was over I really missed hearing all of this information and so I went off to YouTube and found those inspiring people had videos and once again while on the phone I listened to their advice. Then Ocean and John Robbins had a summit of their own with some of the same people and many others, so I joined that. A pain summit came along later however I did not watch but one of those episodes because I had started eating and joined the kickstart your health 21 day Vegan Kickstart. 21 day vegan Kickstart This program is free and you can start it at any time. So I have been busy trying out recipes. I encourage you to try it! They had so much information to share at the summits, and all of them recommended following an eating plan that was similar and Plant based. So when I transitioned to eating I started by filling 1/2 of my plate with vegetables, I cut out meat and dairy as well, and since I wanted to continue to lose weight, I have made my diet SOS free, no added salt, oil, or sugar. I saute my food in vegetable broth or water. I have been eating potatoes, corn, beans, fruits of all kinds salads. I made large batches of dishes so I would not have to cook something new every day. I have been totally Plant based whole food for 2 weeks now and I have lost 10 lbs over the 4 week transition from juicing. I would love to lose 30-40 lbs more. I feel that this is a lifestyle I can live with, and though I felt it was impossible to do in the past, I have learned that I could get there at my own pace, and that took the pressure off of me. So as I eliminated items from my diet, I added on new things and I realize there as so many things that I can eat I don't need to even think about what I can not eat! Oh here is another name Chris Wark From Chris beat cancer google him and if you are healing from cancer you should really see his YouTube videos. I know I am missing someone else who is important and will probably remember later so I will have to make an effort to come back here to share with anyone who reads this. Mexican corn salad with Lime cilantro dressing that is to die for so yummy! Another day of vegan cuisine! I want to make a new dish today. I have been following a lot of recipes, so maybe chili beans. my weight was down 0.6 lbs today which is 10 lbs heavier than when I completed my juice fasting period at the end of the summer 4 years ago. I had gradually put on 20 lbs of the 40 I lost and though it is slow going I am finding that a vegan lifestyle is so much easier than any other weight loss diet because I seem to be continually losing weight in small increments and I can stuff myself with as many vegetables or fruits as I care to, so I am full and satisfied. I made the Mexican corn salad for dinner last night, and also a pineapple mango coleslaw to go with kalua pulled pork sandwiches Friends from Arkansas arrived yesterday late afternoon and we had other friends over for dinner as well. There are fires burning all over California, the air is filled with smoke the last 2 days have been pretty bad. Just took a short walk this morning. Losing weight now that I am eating vegan in small increments but it is coming off and I have now lost 14 lbs since I began eating this way. I don't miss meat, and I try to stay WFPB without the processed vegan foods that are available. Much easier way to eat for sure and lots of great choices! I made this vegan eggplant parmesan following a recipe I created I used 2 different recipes I found recently and substituted my own marinara instead of store bought sauce and I have to say it was the best eggplant parm I have ever eaten. I then froze it in single portions to eat over time, since my husband is really stubborn and will not eat anything that is vegan, he won't even try it. Breading: Bread crumbs either Panko, or your choice. If using panko, add in 1 tsp. dried oregano, 1 tsp dried basil, ½ tsp salt, and ½ tsp black pepper. Salt the eggplant rounds and allow eggplant to drain in a colander 30-45 minutes, quickly rinse and pat dry, pressing any additional liquid from the eggplant. You could also brush off the salt and press out additional liquid if you prefer. Mix milk, flour, and flax seeds and allow the mix to sit 10 minutes to thicken in the refrigerator, to a pancake batter consistency. Dip eggplant into batter and roll in bread crumbs, laying each slice on prepared baking sheet avoid slices from touching. Bake eggplant 10-15 minutes until golden, flip and repeat on the other side, then remove from oven, lower oven temperature to 350 degrees. 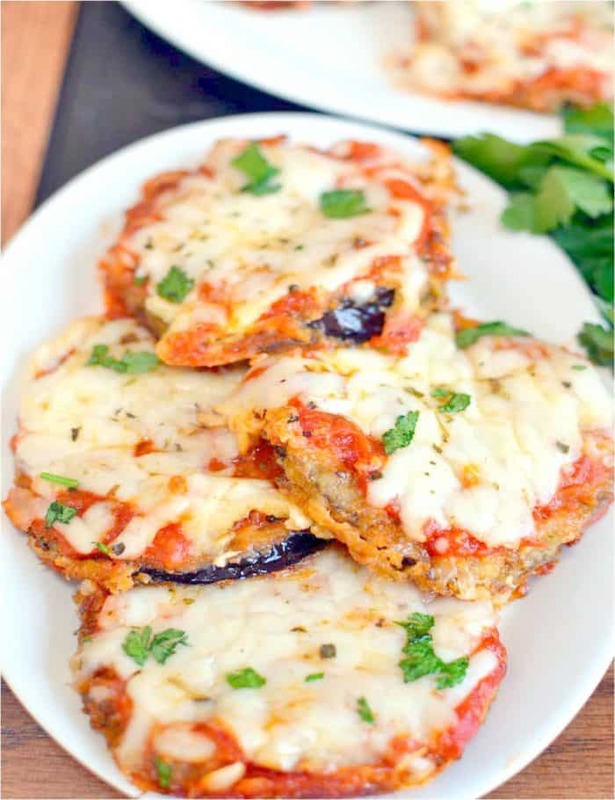 Place a very thin layer of sauce on the bottom of a 8”x13” baking dish, place a layer of eggplant to cover the bottom, pour marinara over the top then a layer of mozzarella and sprinkle of parmesan cheese over the top. Repeat with a second layer of eggplant, topping with sauce and cheeses. Bake at 350 degrees until cheese is bubbly about 50-60 minutes. 1 package medium tofu, crumbled. In a small bowl combine the first 7 ingredients mix well until smooth, and set aside..
Heat coconut oil in a skillet over medium heat add the chopped onion and saute 3 minutes until translucent, add in the tofu, cooking 5 minutes stirring occasionally until most of the moisture from the tofu is evaporated. Add nutritional yeast mixture to the pan and cook for about 4 minutes without stirring until the liquid reduces by half, then stir the mixture and continue cooking for 5 minutes stirring occasionally until the mixture begins to stick to the pan. The black salt has a sulfuric flavor that mimics the smell and taste of eggs. I found it on Amazon, I also used pink sea salt when I first made this and it was delicious both ways. This one is going to be a go to recipe for me, I made this and made 6 burritos on large taco size tortillas. She says to use 2 tortillas, however I can barely fit in all of the egg scramble to two and definitely can not fold over the ends so the goodies fall out. One is enough for me with a side of fruit, you can do potatoes, and toast as well but since I am having a tortilla already I find the fruit is wonderful. In a medium bowl combine sweet potato, 1/2 tsp cmin, 1/4 tsp sea salt, pepper to taste and olive oil toss to coat. spread sweet potato mixture on a prepared baking sheet and roast in oven for 20 minutes, flipping 1/2 way through.until tender then remove from oven and set aside. In a medium skillet heat coconut oil over medium heat and add in garlic saute for 2 minutes or until fragrant. Add 1 tsp cumin powder, chili powder, and cook for 1 min until fragrant add in the pinto beans with the liquid and cook stirring occasionally for 5 minutes until heated through. Add in remaining salt, remove from heat, and mash mixture with a fork or potato masher until you get the desired consistency. 1/4 cup fresh cilantro chopped, If you don't like cilantro you can substitute parsley. In a large skillet heat dry pan over medium heat. Place tortilla in pan for 30 seconds to 1 minute on each side until warm and pliable. Transfer to a plate add approximately 1/4 cup bean mixture along the center length of the tortilla Top with half the tofu, half the sweet potato, salsa, avocado,jalapeno, and cilantro. Roll the tortilla burrito style, place back in hot skillet seam sided down and toast sides and ends to hel the burrito stay together then repeat with the nest burrito. I got 6 smaller burritos from this recipe, so eyeball your servings and practice rolling up these delicious burritos!